After a year out, the international Agatha Christie conferences are back. For the landmark fifth conference, Mia and I thought it time to shake things up. So, we are going on tour again, this time hosting the event at Solent University in Southampton, and we’re switching the month to September. And, for the first time, we have a four-strong committee consisting of Dr Mark Aldridge, Sarah Martin, Dr Mia Dormer, and me. As usual, great keynotes and extra special extras will be announced nearer the date. The bestselling novelist of all time, Agatha Christie (1890-1976) is increasingly being recognised in scholarship and popular culture as one of the most influential writers of the twentieth century. In response to what Martin Edwards calls the ‘lazy critical cliché’ of branding Golden Age Detective Fiction as ‘cosy’, this conference will investigate the significance of the Queen of Crime and her writings within academia and popular culture. 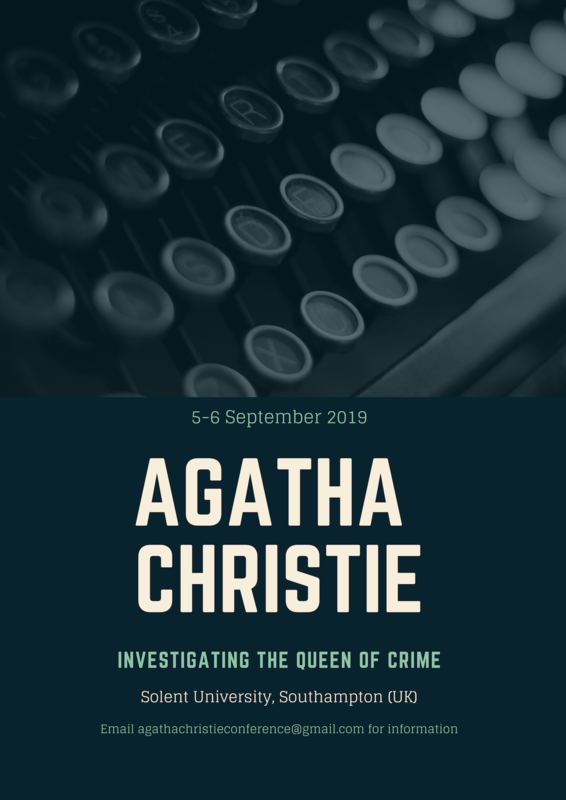 In line with previous Agatha Christie conferences, the 2019 conference will further establish and extend Christie Studies as an academic discipline, across and beyond the humanities. Responding to Christie’s ever-increasing popularity are the annual television adaptations such as 2018’s The ABC Murders, alongside a growing pool of continuation novels and fiction based around Christie’s life and work. Equally, we have academic texts in the new interdisciplinary field of Agatha Christie Studies, such as Agatha Christie Goes to War (2019). In short, as the centenary of her first novel approaches, Agatha Christie remains a phenomenon. All of this calls for an investigation into the Queen of Crime herself, her fictional works and her legacy. In addition to traditional academic paper proposals, we welcome creative presentations and panel proposals. Please send your 300 word proposal with a short biographical note to agathachristieconference@gmail.com no later than 31 March 2019. Please direct all queries and enquiries to the same address.